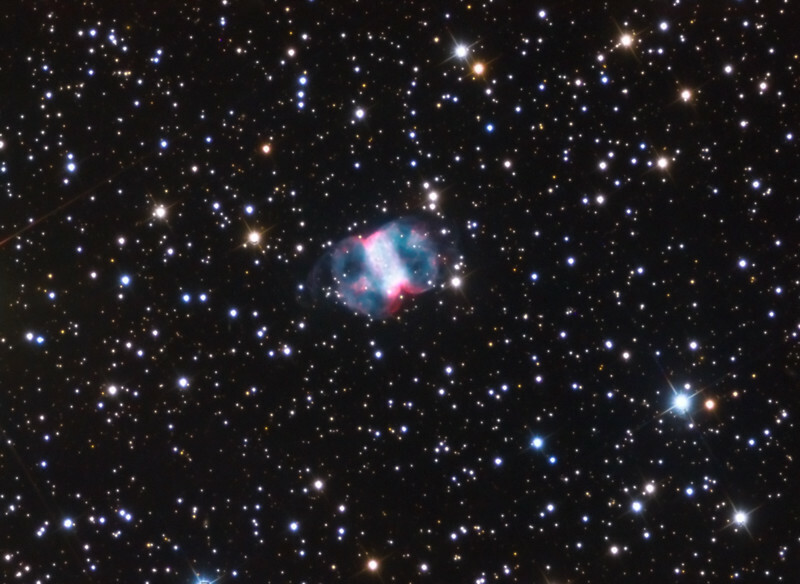 The Little Dumbbell Nebula, also known as Messier 76, is a planetary nebula in the constellation Perseus. It was discovered by Pierre Méchain in 1780 and included in Charles Messier's catalog of comet-like objects as number 76. It was first recognised as a planetary nebula in 1918 by the astronomer Heber Doust Curtis. However, there is some contention to this claim, as Isaac Roberts in 1891 did suggest that M76 might be similar to the Ring Nebula (M57), being instead as seen from the side view. The structure is now classed as a bipolar planetary nebula . The Little Dumbbell Nebula derives its common name from its resemblance to the Dumbbell Nebula (M27) in Vulpecula. It was originally thought to consist of two separate emission nebulae and was thus given two catalog numbers in the NGC 650 and 651. Some consider this object to be one of the faintest and hardest to see objects in Messier's list.